Once upon a time, brands put a whole lot of money into promoting their messages and products/services through something called video advertising. For a while, all was well. But then advertising bumped up against some serious issues like increased video advertising fraud, and those pesky plugins known as ad blockers. Brands were at a loss: how could they reach their audiences in a way that these viewers enjoyed as well as appreciated enough to actually share the brand’s content? Thank goodness the knight in shining armor known as sponsored content arrived just in time to save brands from becoming mere memories in the minds of their viewers, or — worse yet — annoying them to death with more ads. While this fairytale comparison may seem like an exaggeration, Tubular’s recent ‘State of Online Video report for Q2 of 2017’ has revealed some important observations into the role sponsored content (also known as branded content) has played in today’s online video landscape. In short: sponsored content is doing exceedingly well for many brands who’ve tried it, and this trend doesn’t appear to be slowing down anytime soon. Any online video professional or follower knows Facebook is a powerhouse video destination, unrivaled in terms of metrics like user base, monthly view counts, video shares, comments, etc. This, of course, means the platform is ripe with opportunity for brands producing sponsored content and looking to reach their target audiences. And that is precisely what Tubular’s Q2 2017 State of Online Video report uncovered: on Facebook alone, views on branded or sponsored video content were up a substantial 258%compared to Q2 of 2016. Additionally, uploads of this type of content exceeded even that figure by an imposing 311% growth over the last 15 months. Here are the key findings related to branded videos on Facebook, going all the way back to Q2 of 2016. 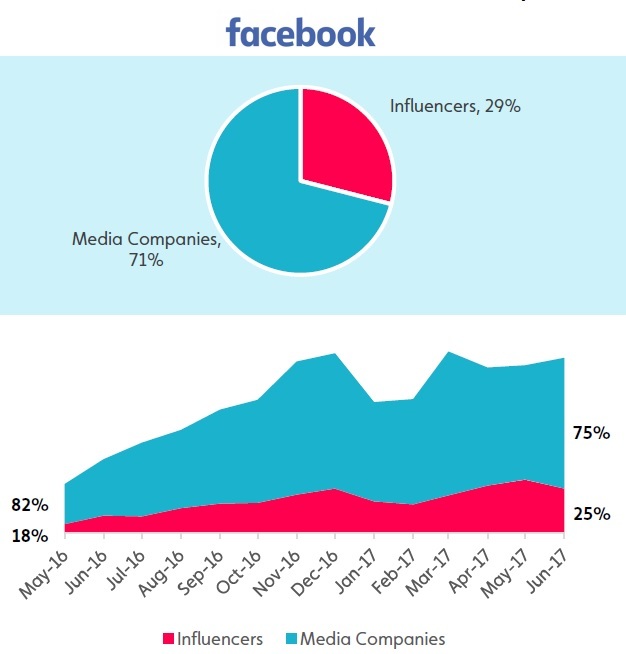 When considering Facebook videos which were marked as branded and also received at least 10,000 views, Tubular’s report discovered that the most views on sponsored video content on Facebook were generated in both December 2016 and March 2017, with each month pulling in around 2.4 billion total views. The holiday season obviously contributed to the former month’s views, as shoppers were looking for gift ideas and inspiration and were inclined to pay attention to brands’ offers. The higher number of views in March can likely be contributed to other factors, though, such as the NCAA’s incredibly popular March Madness event, which is a perfect sponsored content opportunity for sports-related brands. Overall, 2.4 billion views on branded content is nothing to shy at, especially considering the most-watched publisher on Facebook in the month of June (the UK media company LADbible) pulled in almost 2.8 billion views on its own. If content sponsored by brands can perform almost as well as videos distributed by the top Facebook publisher, you know there’s a perfect opportunity for brands to reach audiences on that platform with their sponsored video campaigns. Back in April 2016, brands had only uploaded about 1000 sponsored videos to Facebook. By now, however, they’ve uploaded more than ten times that number. Both May and June of 2017 saw the highest number of sponsored videos uploaded to Facebook in over a year, at around 11,000 videos per month. These figures are roughly 1000 more than the number of videos uploaded in March and April (10,000 each), and a good 4000+ higher than January’s 7000 videos. Clearly, brands are no longer interested in just sticking to a holiday schedule, but are actively working to produce and distribute branded content each month to help spread their message and get the word out about their products and services. A “brand” can be anything from a media company to an individual influencer; on Facebook, at least, it appears media companies perform better in terms of attracting audience views. Out of all the Facebook views generated on sponsored content in Q2 of 2017, 71% of them were on videos from media companies. And since May of 2016, 75% of all sponsored video views could be attributed to media brands, as well. Influencers have their place on Facebook, of course, but any media company not yet creating branded content for the platform is definitely missing out on the attention viewers are more than ready to provide. By now it’s obvious how much Facebook users are willing to invest in watching sponsored content, but which topics were they most willing to watch time and time again over this past year? As it turns out, Facebook users are in love with their entertainment; roughly 1.6 billion views were generated on entertainment-related content alone, with the next-highest view count of 1 billion awarded to sports-based sponsored videos. 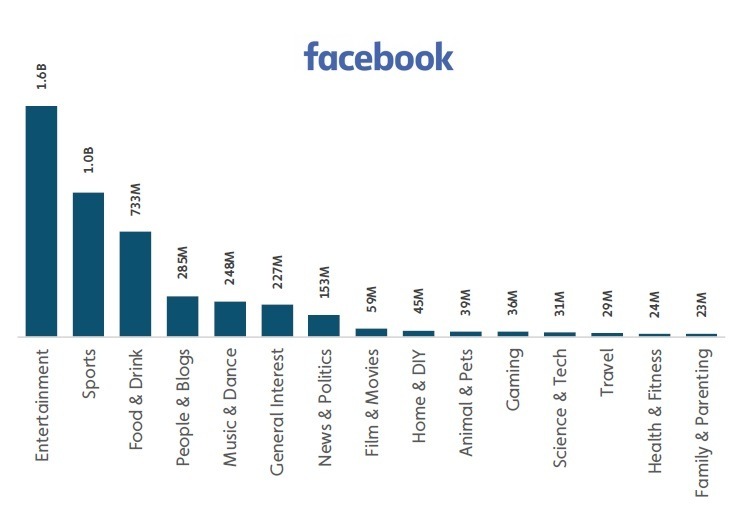 The next three most-popular genres on Facebook in terms of branded videos included food and drink, people and blogs, and music and dance. Essentially, brands have a prime opportunity on Facebook to cater to its users’ penchant for lifestyle and entertainment clips. EllenTube + Disney’s Moana: The clip “The viral father & daughter duo is back…” video has pulled in 73 million views to date, and rightfully so, considering the movie’s lead actress Auli’i Cravalho joined adorable 4-year-old singer Claire Ryann and her father Dave Crosby on set to film the video. The sponsored video has also claimed a V30 of 67.7 million and an average 30-day engagement rate (ER30) of 1.3x. Tasty + My Kitchen Rules: The Buzzfeed-owned clip titled “Pizza Puff Pastry Twists MY KITCHEN RULES on FOX…” showed viewers how to create the titular baked treat in a few simple steps. The video received enough attention to pull in a V30 of 22.8 million and an ER30 of 0.9x, along with 22 million total views. Atlanta Hawks + Disney’s Beauty and the Beast: Hosted on the Hawks’ Facebook page, “A woman was rejected by her boyfriend on the “kiss cam”…” came in third with a V30 of 10 million, an ER30 of 0.7x, and roughly 10 million total views. With two videos in the top three chart, Disney obviously did well for itself this past year in terms of branded content. Our report analyzed all sponsored content videos on YouTube with at least 10,000 views which were also FTC compliant and included the native language of the sponsoring brand or company. The report discovered the peak month for views on sponsored content was in June 2017, where audiences generated 483 million total views on this type of content alone. This number is worth noting because in June, brands uploaded fewer sponsored videos (1.8K) than were seen in the three individual months prior. What this means is that the content produced in June connected more deeply with its target audience(s), a goal brands producing sponsored content always want to reach. The increase in views on sponsored video content in June may be related to the fact that it’s summertime, and more children and teenagers have time to spend on YouTube than they would during the school year. Regardless, the growth of sponsored videos on Google’s online video platform over the last 15 months means brands are starting to trust the platform’s users will more often watch and engage with their branded content as part of their larger video marketing strategies. As for the number of uploads of sponsored videos, brands increased their uploads per month on a fairly consistent basis since April 2016 to hit the peak of 2.1K uploads in March 2017. This month was also the second-highest view count on sponsored content over the past year at 456 million total views. As noted above in the Facebook section, this high view count could be attributed to clips about events like March Madness, or even sponsored content created around developments like the recent election of U.S. President Donald Trump and the ensuing news that change prompted in the wider American culture as a whole. On Facebook, we saw brands and media companies performing exceptionally well on that platform in terms of sponsored content. But what works best on YouTube? As it turns out, influencers are still the biggest driving force behind branded videos and related content. In fact, an overwhelming majority (92%!) if the total views on sponsored videos across all of YouTube were on content uploaded by individual creators and influencers. This number is an increase over the 89% of total views on sponsored videos in April 2016. 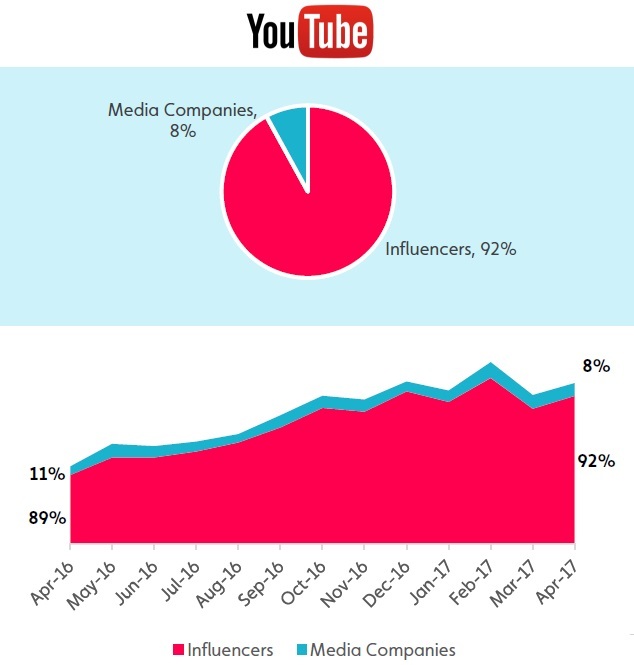 Obviously, any brand looking to work with influencers on a branded content push needs to consider YouTube as a top destination for distributing that content. In terms of the type of sponsored content which generates the most views on YouTube, there’s no clearer winner than gaming-related videos. In Q2 of 2017, sponsored content with a gaming bent pulled in an impressive 195 million views. The next-highest view count came from general interest clips at 120 million, a difference of 75 million views from gaming content. 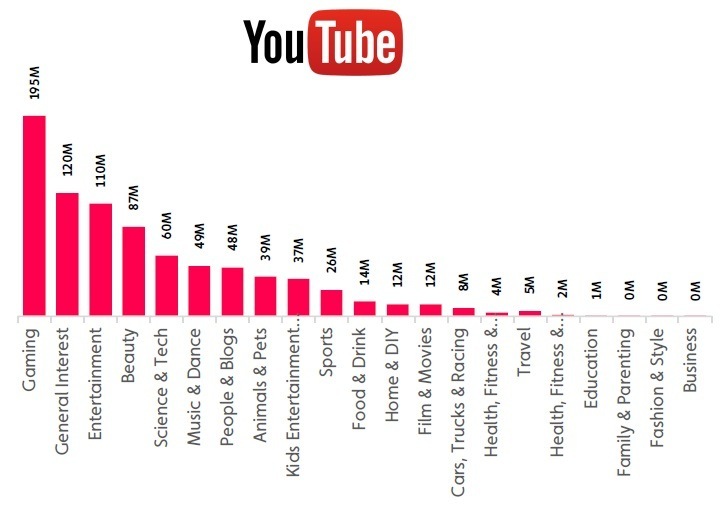 Entertainment, beauty, and science and technology genres rounded out the top five categories YouTube audiences were more than willing to give their attention to in terms of sponsored content in Q2 of this year. The lesson to be learned here is that any brand specializing in these five industries shouldn’t be ignoring YouTube when it comes time to create and push a branded video campaign, especially since these genres cater well to popular video formats like reviews and how-tos. Lionsgate’s Power Rangers: This film topped the list thanks to its partnership with Whistle Sports and YouTube sports and action group Dude Perfect. The resulting video has pulled in highly-impressive stats: a V30 of 13.3 million, an ER30 of 2.1x, and 18 million views to date. This clip alone proves that a well-executed video created with carefully-selected influencers relevant to a media company’s message and goals can generate lots of success and views for sponsored content pushes. Netflix’s Sandy Wexler: Meanwhile, Netflix was the primary partner when teaming with music and dance channel David Dobrik Too to create a clip of him reacting to his old Vinesto promote the streaming service’s original film Sandy Wexler. This sponsored video has generated almost 1.7 million views to date, with a V30 of 1.3 million and a whopping ER30 of 7.4x. NBC’s The Voice: Finally, NBC’s The Voice worked with female lifestyle network Kin Community to generate nearly 1.3 million views, a V30 of 1.3 million, and an ER30 of 0.2x on a branded video featuring three red carpet fashion trends. In today’s current online video ecosystem, brands are facing the challenge of creating content which not only drives views and sales, but which is also transparent and true-to-message so as to build loyalty, trust, and respect among their target audiences. Video advertising is no longer the best option to accomplish these goals thanks to increasingly complicated issues such as ad blockers, viewability, and even fraud. What’s to be done, then? The answer lies in creating sponsored/branded video content. Fortunately, when sponsored content is done correctly and on-message, this media format can accomplish all of the brand goals mentioned above: drive views, generate sales, and increase brand loyalty and trust. As Tubular’s Q2 2017 State of Online Video report proves, viewers are more than willing to dedicate time to watching and engaging with high-quality sponsored video content; now it’s up to brands to keep delivering it.